Confession time! (Big sigh) I made a commitment to write a blog post every week posting on Mondays. Wellllll, I skipped last Monday. I know, I know! The shame, the horror! To be 100% honest, I was having writer’s block, self sabotage, doubt, wondering why in the hell do I even bother. Nobody even reads my blog post anyway. Such ugly thoughts I was having. Wow! I am a huge believer in the Law of Attraction and guess what I was allowing my thoughts to attract? All of the above statements. EEK! Sometimes you have to step back and evaluate what thoughts you allow in and what stories you are telling yourself. And believing! So here I am today, at my desk writing a blog post. You want to know why? Because I was inspired to do it. This week I want to help you figure out why your home doesn’t feel quite right. Why you can’t achieve the look of the Pinterest picture that inspired you to begin with. Take a look at this room. It’s gorgeously balanced and bright. What I don’t like about it is the sofas are “wall flowers”! They are pushed almost all the way to the out side walls. While the sofas look very comfy and inviting, they are several feet apart from each other. During a party you may feel as though you have hollar across the room to your host or other guests. I would suggest moving the sofas into the room about 2 feet. The sofas back leg would be sitting on the rug not on the hard wood floor. The designer was clearly going for symmetry with the design and has done a fantastic job. I feel the rocking chair is out of place and not necessary to promote conversation. I would also place another side table to mirror the right side of the room. 3 feet is the suggested measurement for a walk way between furniture. Space is nice, but an intimate space is more desirable. Move those sofas off the wall. In this photo there are 2 things wrong well 3 if you count that the sofa is against the wall. Sometimes the size of your room doesn’t allow you to “float” your furniture or maybe you aren’t comfortable with that set up. That’s fine. Rules are met to be broken. Design rules are merely set into place to be a guide. Remember its your home that reflects who you are. Let’s talk about these pictures. First they are actually too small for the space, secondly they are hung too high. I carefully drew lines around the frame with my mouse. ( no easy feat) The pictures should be a little taller and could stand to be wider. 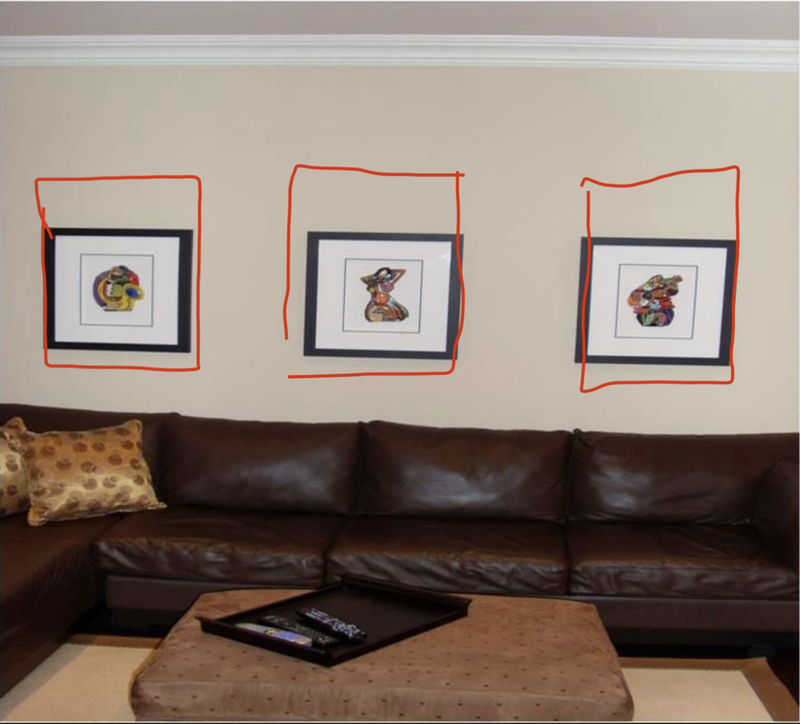 Your picture grouping should take up 2/3 of the vertical space above your sofa. Square pictures can be tricky to get right. These 3 particular pictures would look great hung vertically in a row or even on a gallery wall. Another suggestion for this space would be a rectangular shaped picture. No matter the size or shape pictures should be hung 8-10 inches above your sofa. The center of your picture should be about 57 inches from the floor to keep it at “average” eye level. What’s up with these curtains? Do the homeowners live in a flood zone? The curtains on the left are right in that they are hung a few inches above the top of the window. Which gives it the illusion that your ceiling is taller than it is. But the mistake is they aren’t long enough. The hem should be touching the floor or pooling on the floor. I don’t even know where to begin with the picture on the right! The print is all wrong it doesn’t complement the fabric in the chair. They are outdated and look like grandmas curtains (sorry grandma). And here we are again expecting a flood. Before you pick out curtains it’s important to measure first. If you have average height ceilings of 8 feet. 84 inch panels or 96inch panels will work in your space. Depends on the amount of fabric you want to pool on the floor. Higher ceiling = taller windows. Be sure and measure! For you visual learners like myself, here is a great graphic. 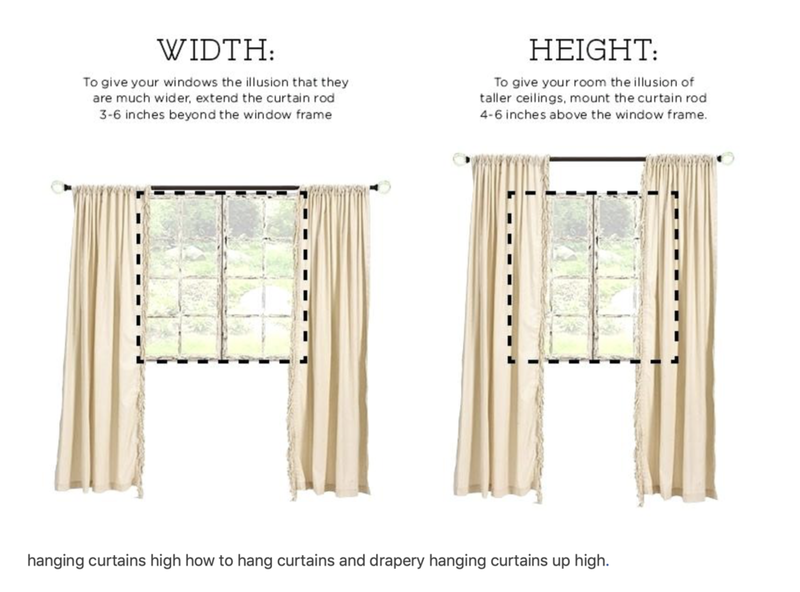 You can actually combine these 2 options going wider and taller than your window to giver the illusion of a larger window. Ok the only thing I’m going to talk about in this picture is the rug. Oh the things I could say! I felt this was a great example of how not to use a miniature rug. 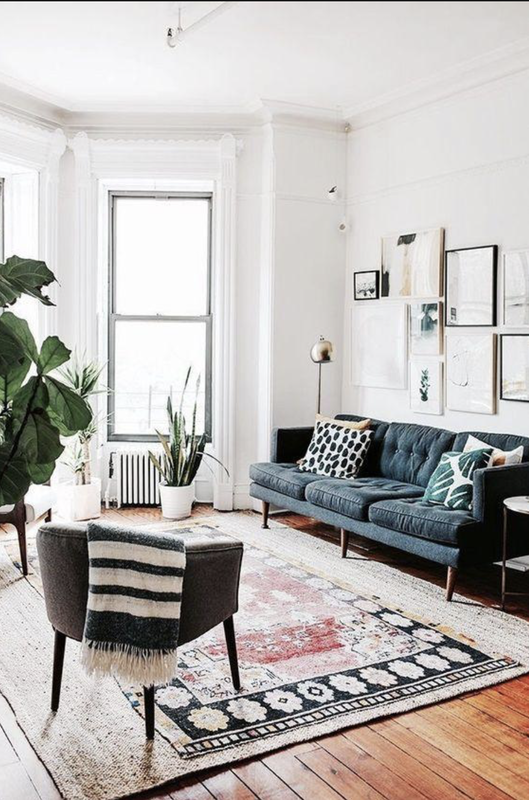 The rug should be 3-4 inches longer than your sofa. In a furniture setting with a sofa, loveseat and 2 chairs. All pieces should be able to have their front feet setting on the rug. Remember to leave enough room to walk past and around your furniture. It may be easier to set up your furniture and then measure for the size of rug needed. Here is an idea that you can still use that small rug. Just layer it on top of another one that is the appropriate size. If layering rugs is uncomfortable to you. Follow this inspiration and use a sisal rug under a flat woven rug. Solid color on the bottom and print on the top. Accckkkk! What in the hell is going on here?! Let me start by saying this sofa is amazing. I mean its a crushed velvet Chesterfield sofa! Does it get any better than that? But OMG I’m seeing triple! Wait what’s the word for 4? Oh yeah quadruple, the ottoman/coffee table. Believe me when I say I did not find this picture on Pinterest. This is an advertisement. No wonder people buy furniture in sets. Can you imagine how much better sales would be for retailers if there was a little more thought put into staging? Keep the sofa, dis everything else. Add 2 matching chairs for one side of the sofa and 1 larger chair for the other side. When mixing furniture consider scale. Know the height and width of your sofa and make sure your complementing pieces measure up. Don’t be afraid to mix fabrics and even patterns. Style comes into play also. It would be best (safest) to choose furniture with the same rolled arms as the sofa. If you are feeling brave or you lean towards an eclectic design, you can mix styles of furniture also. Just remember to always consider scale or size in relation to your sofa. Hope you enjoyed this week’s post. If you learned something let me know in the comments below. If you want to add some thoughts you can do that too in the comments below.